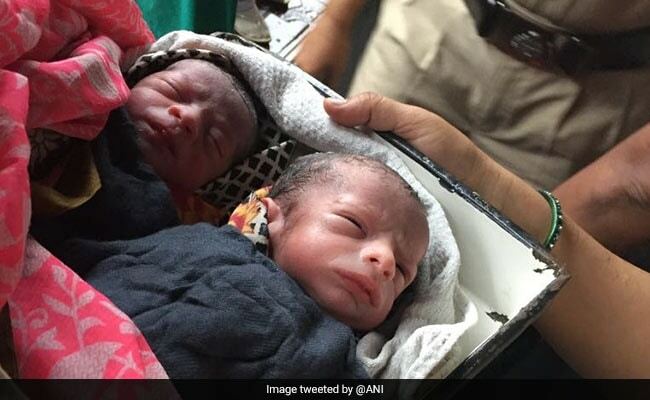 Shaikh Salma Tabassum gave birth to twins in train at Mumbai's Kalyan railway station. The on-duty Sub Inspector Nitin Gaur, who along with two RPF lady staff Head Constables jumped into action after a woman gave birth to twins in train at Mumbai's Kalyan railway station, has called himself fortunate. Speaking to ANI, the Sub Inspector said that both the mother and twins are healthy and doing well. "As soon as I got the information I along with two lady constables attended her and intimated railway medical team and other concerned people. Babies and mother are fine. We felt proud and fortunate that we helped them," Gaur said. Meanwhile, mother-in-law of the woman, Mushraf Jahan said the team who attended her daughter-in-law helped them a lot. The woman, Shaikh Salma Tabassum, a resident of Narayan Nagar, Ghatkopar - was travelling with her family in LTT-Visakhapatnam Express train when she gave birth to the twins after labour pain on board. Thereafter, Gaur, along with two RPF lady staff Head Constables Neelam Gupta and Surekha Kadam attended to the woman at Kalyan in the presence of Railway Medical Staff. Post the delivery, the lady passenger, along with her twins, was taken to Rukmanibai Hospital for further treatment and care.